In its effort to save wildlife and wild places, the Wildlife Conservation Society (WCS) has programs targeted at the growing crisis of wildlife trafficking -- the illegal trade of protected wildlife parts and products. Part of this international problem is due simply to a lack of awareness and education, which affects, among others, some military personnel serving in countries such as Afghanistan. Souvenirs brought back to the U.S. may violate (or contain parts that violate) international restrictions. 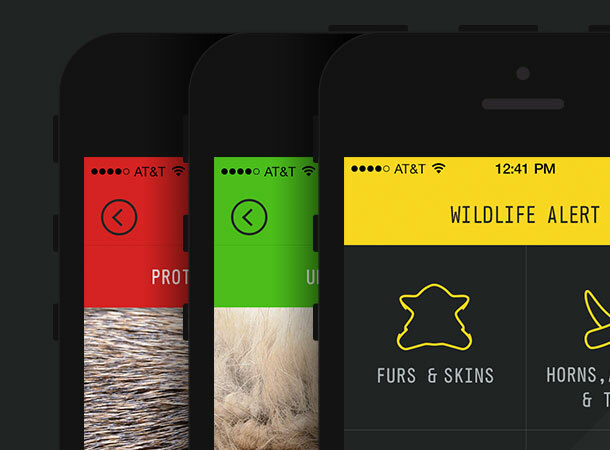 Wildlife Alert is a mobile app that helps address this issue by providing easy diagnostic features to evaluate whether or not a product comes from a protected species. Printed materials and in-person education have historically been the primary means for familiarizing in-country personnel with the types of protected wildlife species and the various products made from them. Through its partnership with the Department of Defense, WCS sought to improve these traditional processes with a new digital tool. We worked with WCS to architect, design, and build Wildlife Alert -- a cross-platform (iOS, Android) mobile app that features a growing library of species information for evaluating the origin of wildlife parts and products. One of the more interesting aspects of Wildlife Alert is that it needs to be able to work offline, as the various environments in which it will be used can have unreliable connectivity (or none at all). Take a deeper look at how Wildlife Alert came together by checking out our case study.